As a popular series of LTE gadgets, Netgear 4G aircards are well-known many countries in Europe and the United States. Especially the hot Netgear Aircard 810s mobile hotspot, is the best seller for LTE advanced networks. Recently, Netgear provided a new 4G LTE mobile router Aircard 800s for Australian network provider Optus and Optus named it as Optus WiFi modem 800s. If this article, we will review the difference between the two mobile hotspots and see which one is better. The Netgear AC810 has a 2.4 inch touchscreen on the front with two buttons for option: home and back. We have Aircard 810 in the version of Telstra WI-FI 4GX Advanced III. But it’s already unlocked for global use. The Telstra Aircard 810 has the logo on the top side of the front. On the back, the Netgear logo is on the back cover, which could be removed to insert SIM card and battery. The Aircard 800s has similar features, on the front, there is a 2.4 inch touchscreen and Optus logo. Two buttons (home and back buttons) are available at the side of the screen. The Netgear logo is on the back cover, which could also be removed for changing SIM card or battery. And they both have two connectors for an external antenna. And the connector type is TS-9. They both use Micro SIM card to get WLAN network for internet access. 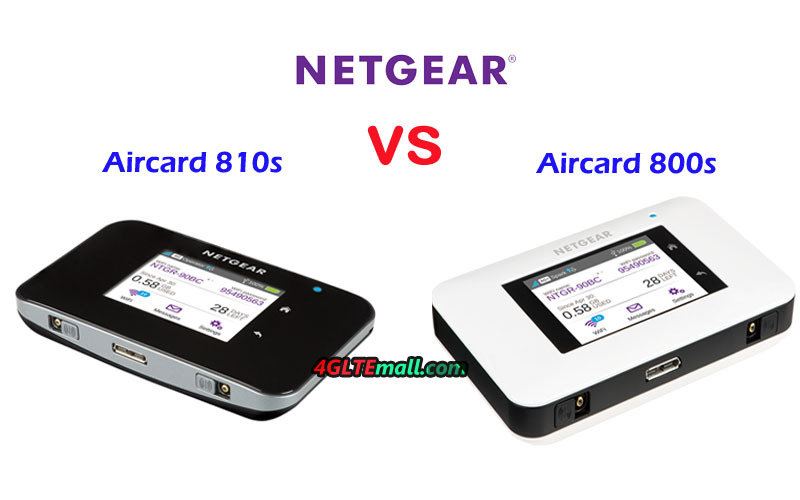 The Netgear Aircard 810s is available for Telstra in black color and Optus 4G WiFi modem is in white color. From the appearance, we can see the color difference, but can’t get other difference. It seems they are made by the same model. Let’s looks at the Specifications of Aircard 810s and 800s and see what the real difference is for buyers and users. From table for the Aircard 810s specs and Aircard 800s specs, the Netgear 810s is more advanced with Qualcomm Snapdragon X12 chipset which can achieve download speed up to 600Mbps. Netgear Aircard 800s is also good to mention with Qualcomm MDM9240 chipset which could support download speed to 450mbps. They support same LTE frequency band B1, B3, B7, B28, but Aircard 810s supports band 8 while Aircard 800s supports band 40, which means the Aircard 810s can’t support TDD-LTE network. Other features of the two Netgear 4G mobile hotspots are same as described. 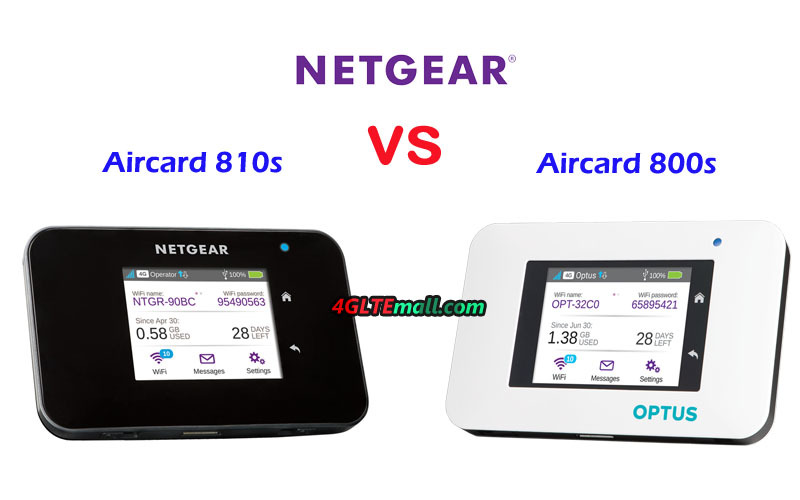 Since the Netgear AC810S is more advanced, the price is a little bit higher than that of Aircard 800s. 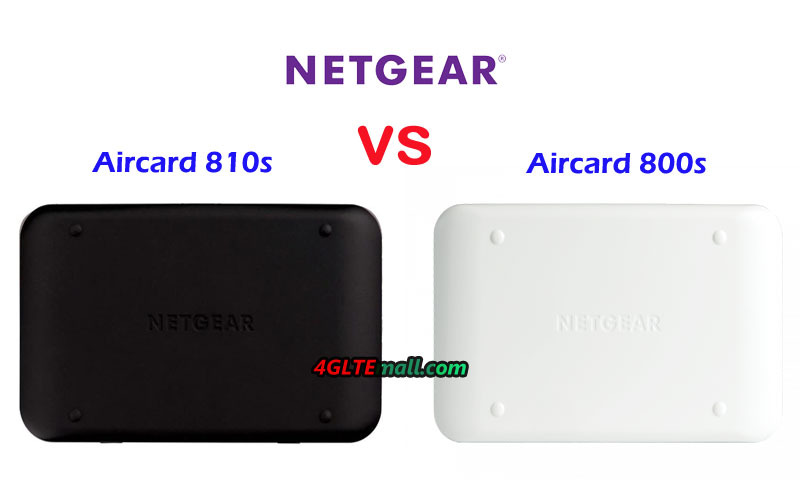 If you would buy a Netgear 4G Router between the two models, first, you need check whether the Aircard 810s or 800s would be compatible with your network provider’s network, and then you need to consider the price. The real performance of the two hotspots 4G has no much obvious difference.